Shahriyar Mohammadi is a 25-years-old Iranian who moved to Bosnia and Herzegovina (BiH) when he was 10 years old. Currently, he is pursuing his master’s degree at Sarajevo School of Science and Technology (SSST) in Computer Science, programme Big Data. One of Shahriyar’s most significant business ventures is the creation of Goody.ba programme and application. How did you come to the idea of making this startup? The application has a very attention-grabbing name, why did you name it “Goody”? It was during an iOS development course at SSST, with Professor Faik Catibusic, that I developed Goody for my course project. Marketing, design and programming have always fascinated me, and through the iOS development course, I managed to combine all three into a unique idea. Once I finished my bachelor, I presented my business idea to Mr. Catibusic and his team from Ant Colony, and together, we turned the concept into a real product. As far as the name of our application is concerned, the goal was to create a name that would be both fun and easy to remember, while showcasing the essence of the application. Therefore, we came up with “Goody” because “goodies” represent gifts and discounts that can be won. Can you briefly explain how Goody works? What are the advantages for the users? Goody introduces a new way of marketing, allowing businesses to promote their products and customers to win goodies. This app feeds advertisements in mobile platforms in a full-screen format. It can not only convey the message effectively but also yield higher conversion compared to other advertising methods. The app is available for both Android and iOS and is completely free for users. Goody offers a wide range of discounts and gifts that are available only in our app. Users can win these offers (we call them goodies) by matching three identical elements on our virtual scratch-card. As soon as this happens, they win a goody, and their prize automatically gets saved in their virtual wallet. Next, they collect their prize by following guidelines specified on the app. Can you enumerate companies with which you have already signed agreements? What are their offers? Some of our partnerships include collaborations with companies such as Hifa-Oil, a petrol station that has stations all around BiH, Four Seasons luxurious restaurant located in center of BiH capital where Goody offers espresso and a dessert for two for free. Also, Malak Hotel Regency, a five-star hotel located on Ilidza, some 12 kilometers from Sarajevo city center, where users of Goody can win a 20percent discount on all desserts. Also, we have a contract with Zlatarna Dar, a jewelry store that offers jewelry and watches of worldwide known brands. Furthermore, our offer includes Cordoba and Casa United restaurants that offer delicious meals. In addition, Radio M and Radio 8 are also on our list of companies with which we have already signed agreements. All of our partners offer exclusive discounts and prizes, such as 10% discounts at Hifa Oil or dinner for two at Four Seasons, that are only available at Goody. Since its launch in December, goody.ba has witnessed huge growth, currently, we are counting more than 8,000 active users, who have scratched more than 500,000 times. 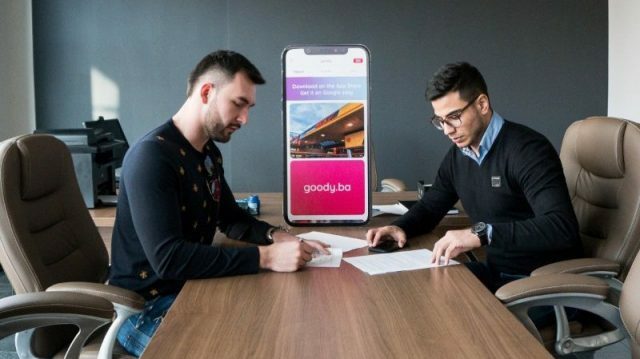 We are happy to announce that Football Club Sarajevo will be joining the Goody family soon and will offer great deals and prizes through our app. The most important thing for us is to continue the path of development and growth we have set our eyes on. We want to transfer this effectiveness by expanding offers for our customers, branching out to other cities, and countries.